Ive been lucky enough to snag a vintage bottle of this stuff, a 100ml splash bottle with two royal appointments and not the one with only one (an earlier version I think). I do not have the most advanced nose but I thought it smelled rather similar to TOBS 74 Original, which maybe isn't that weird as they both have that Victorian feel about them. I did not detect as much rose as I expected though, which to be honest was a bit disappointing but it usually takes a little while before I get acquainted with a new scent - I can write an update later. As always I'm often a bit afraid when buying vintage of how much (if any) the scent has deteriorated over time, if anyone would like a small sample and compare I'm happy to oblige! Last edited by adhoc on Tue Sep 11, 2018 12:38 pm, edited 1 time in total. Owning a couple of old bottles of Hammam Bouquet, and no end of No.74 Original (age doesn't matter for that one; Harpic is Harpic, even if I quite like it), I have to say I see what you mean. If one could excise the strong rose top off the Hammam there would be a base that would be much like the 74 Original. Both very lovable in small doses. Does anyone have any tips for opening a stuck glass stopper? I could open the bottle before but I'm having trouble opening it now... Ive tried to put it in the fridge for awhile but with no result. 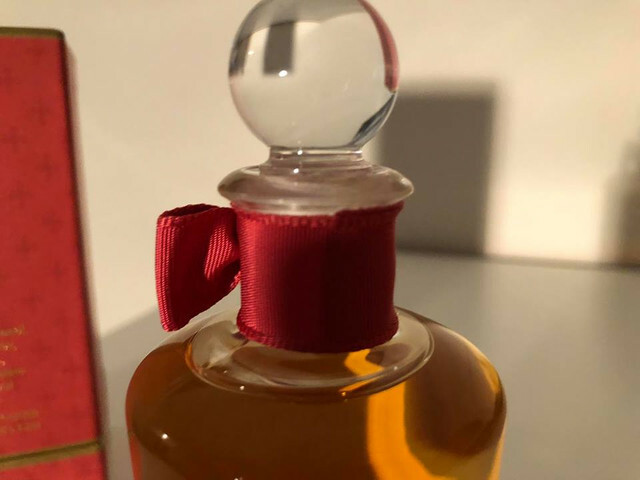 Is it a full glass stopper or does it have a plastic covering on the stopper part that goes into the neck of the bottle? I have a bottle of the single warrant juice and that has a plastic covering on the stopper so there is no glass to glass contact. If it has the plastic part then try wearing a pair of rubber gloves to increase grip. If it's all glass than very light tapping on the sides of the stopper "handle" perhaps with a piece of wood can sometimes help. last resort would be heating the outer neck to expand it combined with pulling and twisting. Glass bottles are surprisingly strong but of course they can only take so much before breaking! This usually occurs without warning and the result can be messy, even bloody. The old stuff is typically characterized as being more "animalic" than the rather more watered down (synthetic?) version that was sold at least up until a few years ago - not sure if Pen's sells HB all all now? On me, the old juice starts out with quite a strong almost civet quality and then dries down to a rather soapy rose with a hint of leather. The rubber gloves is a good suggestion. I recommend holding the neck of the bottle under a stream of hot tap water which will cause the opening to expand microscopically so the stopper will come right out. The refrigerator will have the opposite effect, shrinking the glass and making the fit that much tighter. Thank you both for the help! Your absolutely right - its not a full glass stopper but a stopper which lower part is plastic, same as yours probably! I will try the rubber gloves but I doubt that it would be much of a help because the stopper is really stuck in there. The refrigerator-trick was something i picked up from Basenotes but your (brothers) reasoning seems logical and I will try the heat method instead. Only problem with that would be the textile bow which is in the way - would water maybe damage the bow? Perhaps a blow dryer would be a better option? Regarding the current HB - yes Penhaligons still offers it but I haven't tried that version (I might order a sample just to satisfy my curiosity). As i said earlier, the opening reminds me of TOBS 74 but it dries down to a much cleaner and soapier (in a good way) scent and with a added rose note of course which the 74 lacks but I'm always a bit paranoid about possibly scent deterioration when I buy vintage, however the bottle was unused and probably stored in its box. I got a bottle of Lords aftershave today and I could open that one after a little fight so I just have to be patient with the other one. 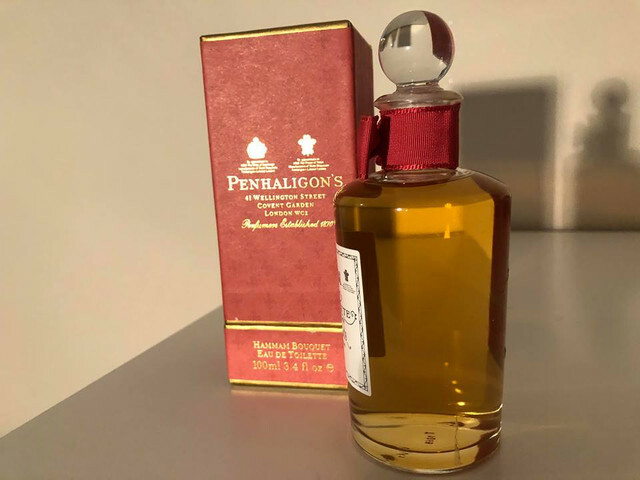 Does anyone have a spare of one of those metal sprinkler that you can attach to a Penhaligon bottle to make it easier to apply the fragrance? Apparently my aftershave didn't come with one of those. The hair dryer seems like an excellent idea. I still haven't been able to open this bottle. As I said before, I was able to open it when I first got it but its been stuck after I took it with me on a trip. Its getting really frustrating. Olie, it's not mine, but if it was, I'd say damn the fabric bow and I'd have my rubber gloves on and I'd hold that little bottle very precisely under scalding hot tap water so the water was running only on the bottle neck and not the little stopper. I would let it get good and hot and I'd twist/ pull with all my might. With all my hand, arm and shoulder strength. As many times as necessary. Something similar to opening a jar of pickles. You can get it off, I'm certain. Don't accept failure! Very important: before I ever put that stopper back, I'd think long and hard about avoiding this ridiculous problem ever happening again. Another challenge to be overcome. And permanently! Maybe some of the guys here will offer some common sense solutions that will actually solve the problem for good. Those surfaces should never be allowed to have that much friction between them. You can and will do this! PS: my only suggested remedy would be to put the little glass stopper away in a drawer and I would get my hands on a flexible stopper such as rubber, cork, etc. Thank you Gary for your excellent post, you have inspired me! So much that I went and bought a pair of rubber gloves yesterday and I'm sticking to your plan tomorrow when I get home, I'll make an update later with the results. 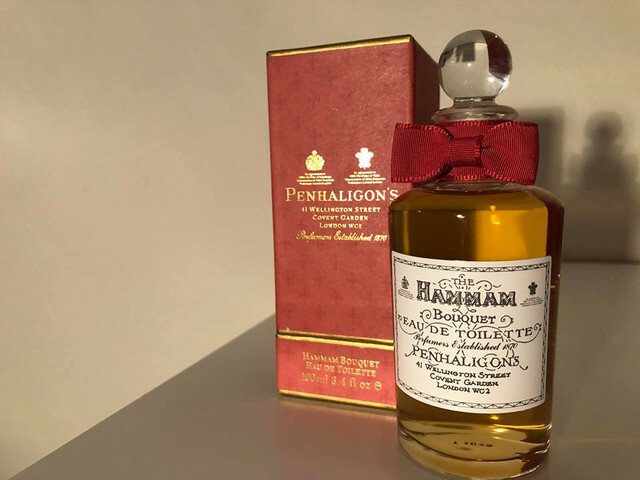 As to avoid this problem later on - I really don't think that will be a problem as I have two other splash bottles from Penhaligon's and I've never had any problem with opening them, its just really limited to this bottle of Hammam. Last edited by brothers on Wed Oct 24, 2018 11:31 am, edited 1 time in total. Olle, were you able to open the bottle without breaking it? I hope you were able to get the bottle open. I never tried the Hammam EdT, but I did briefly use the aftershave. For me, unfortunately, there was something in it that irritated my skin; in addition, its overall fragrance was just a little too exotic and dense for me - altogether too much of the Turkish steam bath. Gary and everyone else - I'm sorry to disappoint you but I still haven't been able to open it (as of yet) and I didn't have the heart to destroy that little bow. However, I did find another vintage splash bottle from the same era... and.. I.. bought it! I like the cologne so much that I wanted to have a spare bottle anyway and now I don't need to hurry to get the first one open. Maybe I keep it that way to preserve the juice? You can call me stupid but I thought this was the way to go! Olle, it's your decision and if it makes you happy, that's all that counts. As you say, now you've got a backup! Just curious, why do you think you'd be destroying the bow? A little water shouldn't make any difference. yes, you are probably right! But I think I leave it as it is now and wait for the new bottle to arrive instead! I had my eyes on two Hammam aftershave bottles on Ebay but they seem to be gone now, probably for the best! I just have to share a highly interesting old book (1893) I stumbled upon. A small section of the book is devoted to Penhaligon & Jeavons and there is a reference to Hammam Bouquet and even more interesting, a reference to some perfume called "Marechal Bouquet", which I never heard of. Perhaps I should email Penhaligon myself to see if they have more information. "...The house is frequently Visited by Royalty, and by a large connection among the nobility, as well as by various titled personages, for whose absolute comfort the firm have provided everything which a refined conception of appointment could be expected to suggest. ‘La Coiffure Francaise Illustree’ recently referred to the house in the highest complimentary terms. ‘St. Stephen’s Review’ and ‘Piccadilly’ have both made flattering allusions to the attractiveness of the establishment; and ‘Life,’ while describing it as perfect, also refers to the “quintessence of rich and rare exotics for the bath and the toilet — utile dulci.” The greatest of all the firm’s specialties in perfume manufacture are the “Hammam” and Marechal Bouquet. The intrinsic merits of the former, its lasting qualities, and general fragrant charms, have made its name everywhere famous, as, for the same reasons, it has also done much to sustain the prestige of Messrs. Penhaligon & Jeavons in the first rank of parfumeurs: The “Hammam” Bouquet is registered and protected, and, apart from the extensive demand it has so deservedly created, it has won the estimation of every royal house, and is used and accepted in all the courts of Europe. " http://messybeast.com/1893-illustrated- ... london.htm - Just search for Penhaligon and you will find it. Last edited by adhoc on Tue Nov 06, 2018 7:36 am, edited 1 time in total. My second bottle arrived today and yes I could get it open! A little too much open as I spilled some juice on my leg and some drops on the floor, well well it smells really good in my apartment now anyways! The new juice has a somewhat lighter colour than my other bottle but they smell the same. Now I only have to get my hands on some of that Marechal Bouquet!